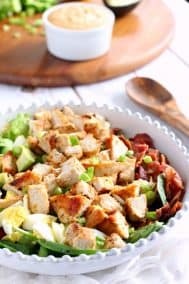 This healthy from-scratch recipe for Paleo Chipotle Ranch Chicken Salad is packed with flavor and so versatile! Have it over salad, in lettuce wraps, or even use it as a dip for raw veggies. Made with homemade mayo, it’s Paleo, Whole30 friendly, soy, dairy, and sugar free. Do you like chicken salad? Check. Do you like chicken salad packed with so much flavor that it’s as addicting as chips? Sign me up. So, I have a bit of a thing for chicken salad that goes way back to my childhood days eating at diners with my family. I think I ordered chicken salad on an everything bagel for 2 years straight, right after a one year spinach pie stint and a 3 year cheeseburger obsession. That reminds me I need to make a paleo spinach pie – good thing I mentioned that. Anyway, let’s move ahead to chapter 2 kids! 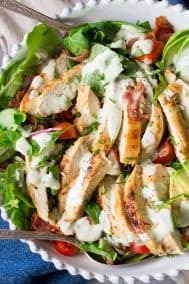 This is a spicy Chipotle ranch flavored chicken salad and it is SO good. Like licking the bowl kind of good – I’m not kidding when I said you’ll get addicted. Luckily, it’s made with all real food ingredients so you have the go-ahead, at least from me. And, if you eat bread, you can even have it on a sandwich. Is sandwhich a dirty word if we’re doing Whole30? Look, I’m just as scared of the Paleo po-po as you, so maybe just don’t mention the s-word thing. Your secret is safe with me. Don’t be intimidated by the homemade mayo for even a second – it’s super easy to learn how to do and very much worth making, since it will save well as long as you have a fridge around and there are SO many great uses for it. I learned how to make homemade mayo when I did my first Whole30, and have since tweaked my own recipe to make it perfect for whatever I’m adding it to. I originally learned this from the book Well Fed: Paleo Recipes for People Who Love to Eat by Melissa Joulwan, which was my first intro into the culinary paleo world. This was a life-changer for me, and the seeds were sown for great things to happen next! My easy homemade mayo is almost always the base for dips, dressings and sauces I’ve made since eating paleo. 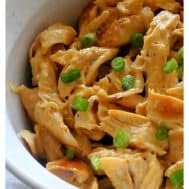 The version in this recipe is based on my original, with spices added to give it that amazing smoky, chipotle ranch flavor! I definitely encourage you to experiment on your own with different seasonings in your mayo recipes to find what suits you best. 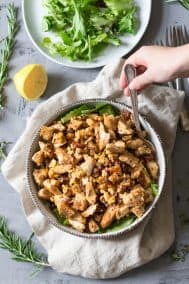 Spicy Paleo Chipotle Ranch Chicken Salad that's also Whole30 friendly! Packed with flavor and so versatile - wrap in lettuce, serve over salad with avocado, or use as a dip for veggies or plantain chips. 1 lb boneless skinless chicken breasts - cooked, cooled, and chopped (I sauteed mine in coconut oil but you can cook anyway you want. Have your cooked, cooled, and chopped chicken breasts set aside in a large bowl. In a tall cup, add the mayo ingredients in order and put your stick blender in the bottom but don't turn on. Once it's all the way down, turn it on and mix for 30 seconds before slowly moving it up toward the top to fully blend the mayo. From the mayo you made, take a half cup and store for later use. For the remaining half cup, add the Chipotle Ranch Seasoning ingredients and mix well with a spoon to incorporate. You can taste and adjust to preference if necessary. Do you make homemade chicken salad? Any Paleo/real food recipes that made Paleo really work for you? Love the fact that you made your own mayo! That is fabulous! And love the flavors that you’ve included. Chipotle is such a great flavor, but it can easily be overwhelming if not done correctly. Yes I know what you mean. I’ve gone overboard with chipotle, which isn’t hard for me since I’m a wimp with spice, and it kind of ruined the whole thing. But with the right amount it’s magic! I used the mayo recipe once and it creeped out my husband. He thought we would die from eating raw eggs. Any words of advice about this because then it got me thinking too and I’ll admit I also got a little worried. Aren’t there raw eggs in real mayo anyway I guess? Obviously I still have lots to learn about this stuff. 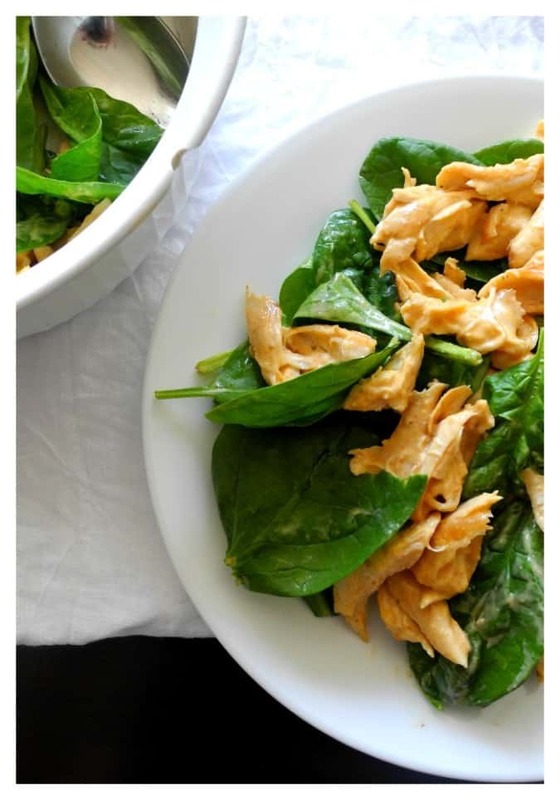 I haven’t eaten chicken salad in a while but this sounds great if I can just get over the egg thing! I was weirded out at first too, and my suggestion would be, at least for the purpose of mayo, to use local pastured eggs because then you’d know almost 100% that they are safe! I think the risk is minimal anyway but higher if you use any old grocery store egg from who knows where. And if it helps, I’ve been eating it for a year and haven’t had a problem. Also, raw eggs are used for most homemade mayo that many people ate growing up, plus in other sauces. I honestly don’t know if my husband realizes he’s been eating raw egg in mayo. Actually I’d be surprised if he knew mayo had egg in it at all! Hi Lisa – I’m sure it provides a different flavor (which I still find good) but I have used 1 tbsp ground flax seeds soaked in ~3 tbsp water for 10 minutes to replicate the egg in mayo recipes before. I only buy pasteurized eggs now so I look forward to trying Michele’s mayo recipe with the egg. This looks so good! I find it impossible to eat salad on its own, it has to be with some type of meat so this looks perfect 🙂 I don’t think I’m brave enough to make my own mayo though – laziness! If you have an immersion or stick blender the mayo takes less than a minute, seriously. It’s the easiest thing to make! I first made it in my food processor and it took forever, this makes it 100% doable. I love chicken salad with lettuce. Yum. Mark Bittman’s “How to Cook Everything” is very helpful – how to roast veggies, cook all cuts of meet, mayo recipe. Great book in my opinion. Thanks for the recipe, Michele! That book seriously did teach me how to cook! It’s the most use I’ve ever gotten from a cookbook. I have really enjoyed the ranch dressing recipe you posted a while ago and this sounds like another tasty one. There is raw eggs in mayo and who knows what kind of eggs they are using, but I can guarantee they are not pasture raised especially in the USA where our federal food standards are almost no-existent. I buy pasture raised and they look and taste completely different. Also, give yourself a break–you cook and prepare tasty paleo dishes. Good ingredients and healthy. You are a roll model to your family and others learning to live the same lifestyle and for that I thank you!! I always tend to go overboard with the mayo, but I’m excited to try your chipolte version. I’m going to use MCT oil. MCT oil would be great. Any oil without a strong flavor works well. No evoo though, that ruins the flavor. good thing i read all of your replies too! i would have used evoo. will search for something else this weekend. I’ve used light flavored olive oil (the cheaper kind) and avocado oil (which tends to be pricier) and gotten good results. I love this recipe, you just seem so whole, tasty and just like really great food! I am a big fan of chicken salads! I’ve always loved chicken salad so thank goodness I learned how to make homemade mayo after going paleo. Such a great base for so many sauces and dips. Can’t wait to try this kind of Mayo! My chicken salads are always so boring. Is it weird that I love eating chips with mayonnaise? We dip everything in mayo and use it in a lot of different ways so chips isn’t weird at all! I dip my homemade plantain chips in mayo sometimes. YUM! our freezer is stocked with smoked salmon right now as it is the season but I love a good salmon salad with lots of spicy mayo. If we ever run out of fish (ha ha!) I would re-stock with chicken. I haven’t ever made my own mayo but I will have to try now- and flax eggs intrigue me as I frequently run out of fresh eggs 🙂 I don’t know about changing the game for me on the paleo wheel but I read Mark’s Daily Apple blog and I have never made a bad recipe from his posts! I think that would work really well too! Really you could use this mayo recipe with anything. Marks Daily Apple was really helpful for me too. 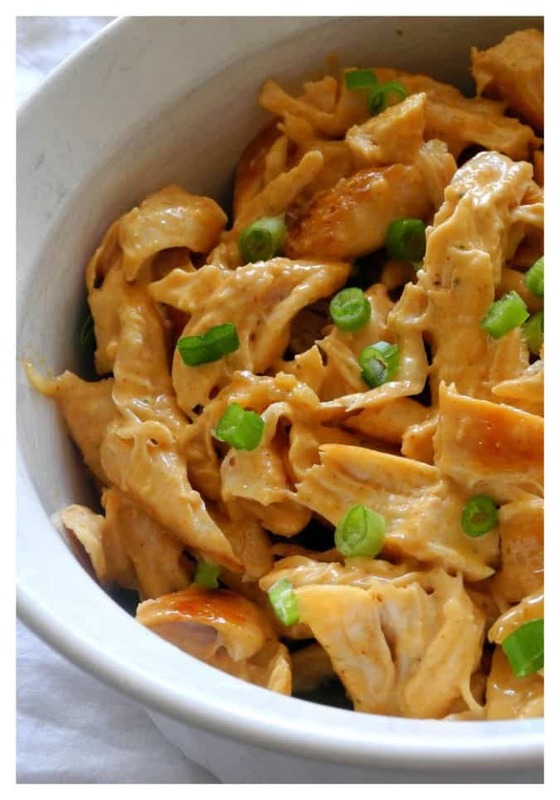 I’ve only tried mayo once and it was a total fail 🙁 I’ve been working up the energy to try it again – maybe this weekend, because this recipe looks yummy!! If you don’t already have an immersion blender it’s completely worth it for all the quick sauces, dips and dressings you can make. And so glad you think I’m funny! I feel like I need to jazz up my recipe posts somehow, and honestly it’s hard to be THAT serious about food. I used to make chicken salad. It was surprisingly good. Now I don’t eat chicken lol. So I make chickpea avocado mash which I swear is as good, if not better, than chicken salad. Or, I just don’t remember much of what chicken tastes like anymore. ha. I’m sure the chickpea mash is good! I mean what isn’t good with avocados? Do you think you could make this without cooling the chicken first, so it is a hot dish? I think you probably could, the mayo would melt but it would probably still taste good, tossed with some veggie noodles maybe? Hi Michelle! This looks great. Quick question– what do you mean by chipotle powder? I dont think i’ve ever seen it. What brand do you normally buy (and where)? Thanks! Hi and thank you! I use McCormick Chipotle Chili Pepper. I bought it at Stop and Shop I believe but it’s probably in most stores.